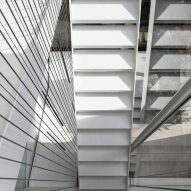 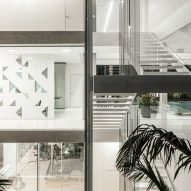 Light and movement can be glimpsed through triangular openings in the white aluminium facade of D3 House, a Tel Aviv home designed by Pitsou Kedem Architects. 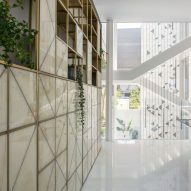 The three-storey, 670-square-metre property is located in Herzliya Pituach, a luxurious beachfront neighbourhood to the north of the city. 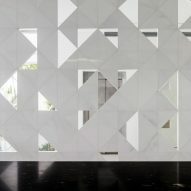 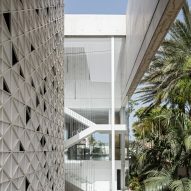 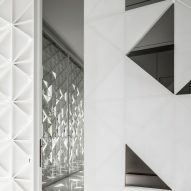 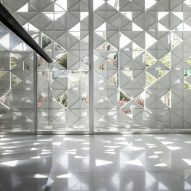 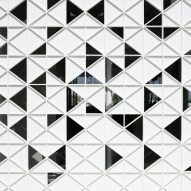 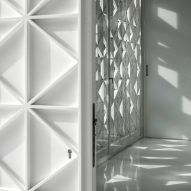 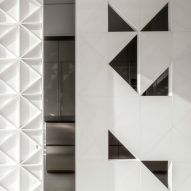 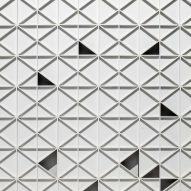 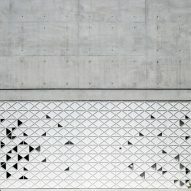 While the upper section of the property presents a facade of exposed architectural concrete, the ground floor is fronted by a wall of white aluminium panels, made up of a repetitive graphic pattern of tessellating triangles. 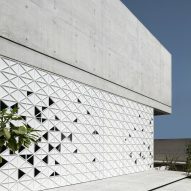 The house's front door, also clad in the white aluminium panels, camouflages into the facade. 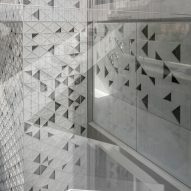 Some of the triangles are cutaways, allowing an illuminated pattern to emerge on the wall by night. 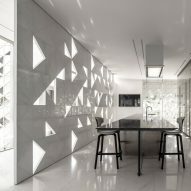 "The facade of the house is in fact a kind of sealed 'box' composed of two large volumes," explained Pitsou Kedem Architects. 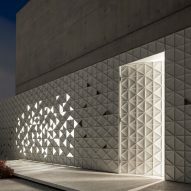 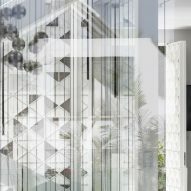 "One horizontal facade is made up of a white aluminium skin with a repetitive graphic pattern in which cut-out openings allow a glimpse into the house during the day and the filtering out of artificial light at night," said the studio. 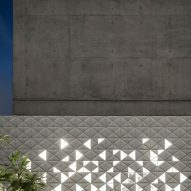 "The upper volume is constructed of exposed architectural concrete to create a tension against the lower volume." 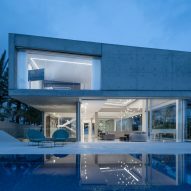 The house's upper volume has a diagonal sloping roof, which the architects said was designed to emphasise the contrast between it and the perforated white aluminium facade below. 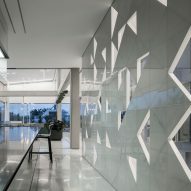 This massive wall, made from a mix of iron and natural stone, carries the design theme through from the exterior into the house. 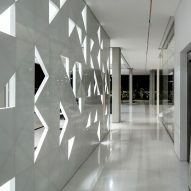 Inside, the geometric perforations cast decorative light and shadows onto the walls and floors. 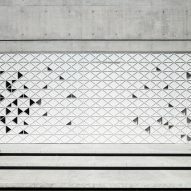 "The pattern of semi-triangles, and their seemingly random spacing, appear to epitomise the rhythm of the movement of light," explained the studio. 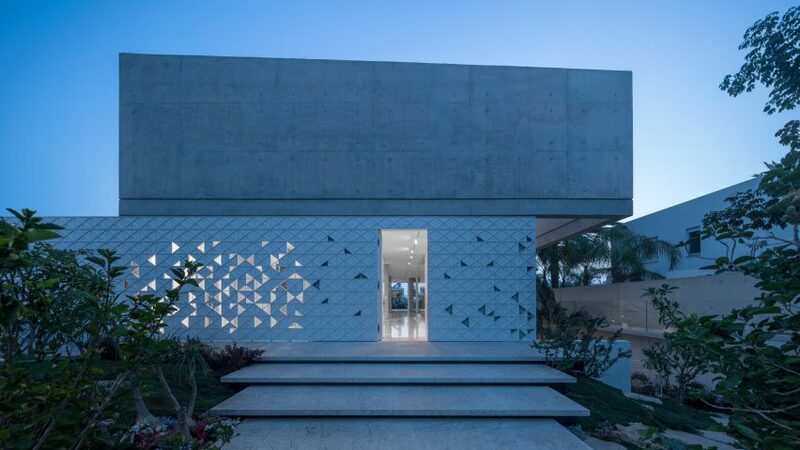 The geometric pattern seen on the facade is repeated throughout the property, in places such as on a bespoke shelving system or the stone wall in the entrance hall, which serves as a divider between the entrance hall and the kitchen. 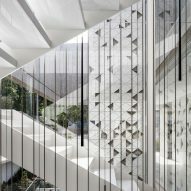 The building's other facades feature huge floor-to-ceiling windows that create a greater connection between the house's surrounding gardens and the interior spaces. 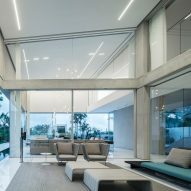 At the rear of the house, the ground floor elevation is made entirely of glass, to make the first floor appear as if it is hovering above the ground. 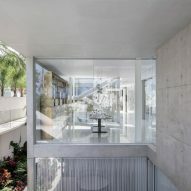 From the back of the house, it is possible to see right through to the front garden when the door is open, while a large courtyard at the centre of the house creates more connections between inside and outside. 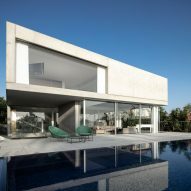 The rear patio looks out over an infinity pool that sits flush with the stone patio. 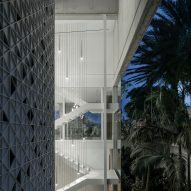 "The formal polishing, the precision in the detail and in the meeting of materials, the meticulously yet cautiously phrased monastic language all give us, for a moment, a sense that we are looking at a flat and nearly two-dimensional picturesque stage," said the firm. 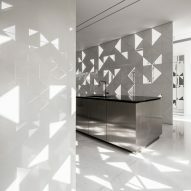 "The diverse and continuing planes of the white tones and the combination of the geometrical performance of the light against the horizontal and vertical surfaces, give the tranquil picture a sense of space and depth." 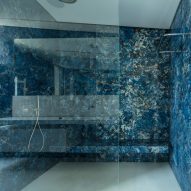 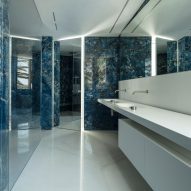 The interior spaces feature clean lines and luxurious finishes, such as the bathroom, which is clad in blue marine-coloured Blue Lava stone from Brazil. 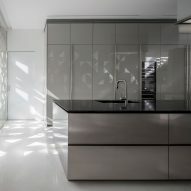 Much of the furniture is bespoke and made by furniture brand Object, including the brass and onyx bookcase in the dining room, which was designed by architect Irene Goldberg. 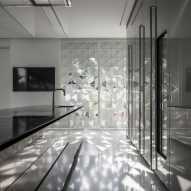 Pitsou Kedem Architects often uses metal screens and perforated walls in its residential projects to allow for flow of light, air and views. 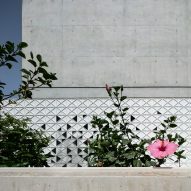 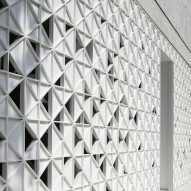 Examples include a house where bands of shutters feature a geometric perforated pattern and a property with a perforated facade designed to reference the traditional regional latticework.